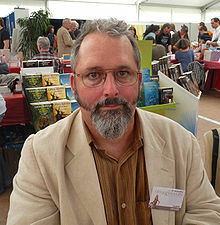 Gregory Keyes is an American writer of science fiction and fantasy who has written both original and media-related novels under both the names J. Gregory Keyes and Greg Keyes. Keyes was born in Meridian, Mississippi, as John Gregory Keyes. He received degrees in anthropology from Mississippi State University and the University of Georgia before becoming a full-time writer. He is famous for his tetralogy The Age of Unreason, a steampunk/alchemical story featuring Benjamin Franklin and Isaac Newton. He wrote the Babylon 5 Psi Corps trilogy, a history of the Psi Corps and a biography of Psi Corps member Alfred Bester. In 2009 it was announced that Keyes would be writing two novels based on the successful computer game The Elder Scrolls IV: Oblivion. The first of these, The Infernal City, was published by Random House in November 2009. The second, Lord of Souls, went on sale on September 27, 2011. Greg Keyes builds his stories around multiple main characters who meet only rarely, but allow the reader to follow different threads of the same events. Most of the chapters in his books focus on one of the main characters. Chapters often end in a surprise or a cliffhanger as the story moves to follow another character. Keyes' knowledge of fencing and linguistics also figures heavily in his books. For example, Stephen Darige, one of the main characters in The Kingdoms of Thorn and Bone, is an adept linguist, and his knowledge and skills play an important role in the development of the story.